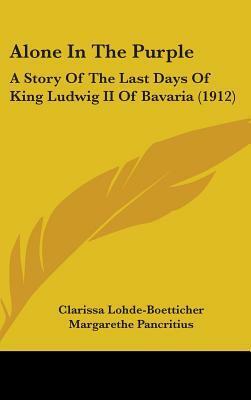 Originally published in Germany in 1912, this novel about King Ludwig II of Bavaria is the closest in time to Ludwig's reign (he was deposed and died in 1886) that I've been able to find in English. The novel definitely has a 19th Century feel to it, with a good bit of melodrama and weeping aristocratic ladies and honor-bound gentlemen. I can't guess how much of the facts of Ludwig's life or death were known to Lohde or anyone else in 1912. Many of the characters as they appear in this story appear to have been completely invented and have no historical basis - same goes for the romantic subplots and the spurned ex-(female)lover of Ludwig whose bitterness plays a crucial role in his downfall. None of this is to be found in the biographies of Ludwig that I've read. It is not surprising that Ludwig's homosexuality is never mentioned or dealt with, although there is an odd and brief reference to him being a woman-hater. Still, it's not a bad little story for the time period and Lohde's portrayal of Ludwig is sympathetic - a distinguished monarch whose vision who was misunderstood. He is shown as surrounded by a court that wanted to undermine him for their own personal gain or to fulfill some vendetta, while his public loved him. In the end Ludwig is shown as making choices that would be the best for his people and that would protect those few friends who had remained faithful and loyal. That might be the biggest honor which an author can bestow on a leader's legacy.